These are just some of the descriptions parents have used after seeing their babies for the first time. Watching their movements, facial expressions, and features – parents, grandparents, and friends alike all excitedly try to decide who the baby resembles most. What makes this truly an amazing experience is that it is all happening months before the baby is born - while baby is still in the womb! This is the miracle of 3D/4D ultrasound. 3D/4D ultrasounds offer parents the opportunity to see their babies well before their birthday, creating an incredibly intimate bonding experience. It is one thing to feel your baby move but quite another to see that those movements are not only feet kicking; but also hands waving, stretching, yawning, and even thumb sucking! Studies have shown a profoundly positive impact on parents. 2D ultrasound works by "listening" to sound waves in a single plane. The ultrasound is directed out and reflected back again. An ultrasound is the interpretation of these reflected sound waves to form a visualization of the baby. In 3D ultrasound, the same ultrasound used in traditional 2D is emitted – this time at multiple angles. 3D ultrasound images are created by an algorithmic process commonly known as "surface rendering". These multiple reflections are interpreted through sophisticated software, and an accurate 3D image of the baby is instantly created. These amazing rendered images are displayed with incredible surface detail which delineates both body and facial features. 4D ultrasound is captured in the same manner as 3D ultrasound - but the rendering occurs many times per second. Instead of looking at a single still image (3D), you are now able to view real-time "video" of the baby in the womb (4D). In this case, that 4th dimension is time. It is also important to note here that 3D/4D ultrasound is NOT a product of increased power levels. The levels are the same as with a traditional 2D scan. 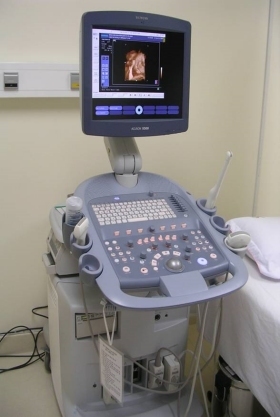 Ultrasound equipment used to obtain these amazing 3D and 4D images are the very same devices being utilized in hospitals and physician offices throughout the country. And it's the FDA that sets the standard for level of energy to be used for various scans - including 3D/4D. Expectant parents everywhere are opting for elective 4D ultrasounds; believing that it will have a positive impact on their pregnancy. Some mothers tend to improve their diets and eliminate harmful behaviors such as smoking or drinking. Other ultrasound benefits can include increased paternal involvement, family support, and empathy. Some feel it may even help siblings share in the experience and bond with their new brother or sister. Some physicians are understandably concerned that mothers will use an elective ultrasound in lieu of the diagnostic ultrasound prescribed by their physicians. This is why it is imperative that a physician-ordered, full-anatomical ultrasound study should always be the prerequisite to confirm due date, screen for fetal anomalies, and identify any other potential prenatal issues. The parents-to-be can then utilize this elective session as an insightful, bonding experience. Although there may be plenty of entertaining aspects to a 3D/4D ultrasound, safety and professionalism should always remain paramount when choosing your elective imaging provider. A responsible ultrasound provider will require proof that the client is seeing a healthcare provider for prenatal care during her pregnancy. The provider should always use the system's obstetric mode to keep well within FDA established levels of frequency and power for prenatal use. Remember that word of mouth is usually the best method of referral amongst expectant mothers. So do your homework, and ask around. The most rewarding 3D/4D ultrasound experience will be the culmination of a comfortable and inviting facility, the finest equipment, and a professional, courteous staff whose primary focus is on you, your experience, and (of course) your baby.